TOWSON, Md. - In a rare occurrence, a Baltimore couple has added three identical members to the family. 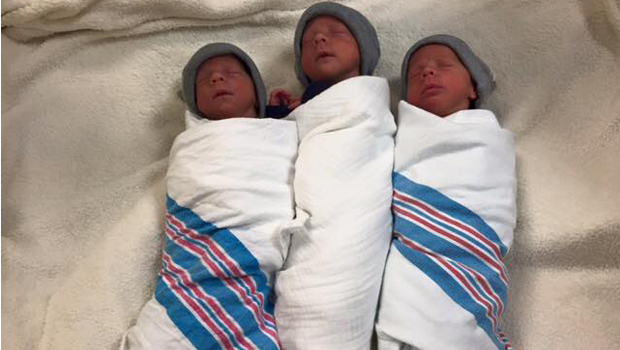 Greater Baltimore Medical Center announced this week that Kristen Hewitt gave birth to identical triplets Oct. 6. She and her husband, Thomas Hewitt, named the three baby boys Thomas III, Finnegan and Oliver. The triplets were delivered via C-section after about 33.5 weeks in the womb. Each of the boys weighed 3 to 5 pounds. They're calling it the "Hewitt Hat Trick" -- also the name of the blog in which the couple documented their journey toward triplet parenting. The couple's doctor, Dr. Victor A. Khouzami, says he's never witnessed identical triplets in more than three decades at the hospital. According to the American Society of Reproductive Medicine, triplets generally are uncommon, and only about 10 percent of the time are they identical. The identical Hewitt triplets do have some company -- several other sets of identical triplets have been reported in the U.S. this year. Last month, Kelli Fenley of Long Island, New York, delivered identical triplet boys weighing in at about 2 pounds each. Another set -- also boys -- was born to a Montana couple in January, and a Pennsylvania family welcomed identical triplet girls in February. Their doctor called the occurrence "one in a million."